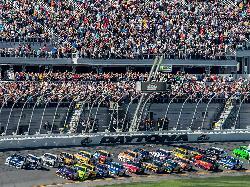 This contest has been marked as a duplicate of == Win a Trip for 2 to the Daytona 500 ($3,000)! ==. Prize: VIP NASCAR® experience at a NASCAR®-sanctioned race in 2019! The grand prize winner will receive NASCAR® VIP passes for two, travel and hotel accommodations, access to the Sugarlands VIP area, and more! Statistics: This contest was opened by 5 and entered by 0 ContestChest.com members. 0% of those who opened the contest, entered it.